No, President Trump and the Republican Congress haven‘t “repealed and replaced” President Obama’s Affordable Care Act (ACA), the federal health care law, yet. But yes, as Open Enrollment began on Nov. 1st, there are significant changes than in previous years. The enrollment period ends on Dec. 15th for coverage through the 2018 Federal Health Insurance Exchange to begin January 1, 2018. 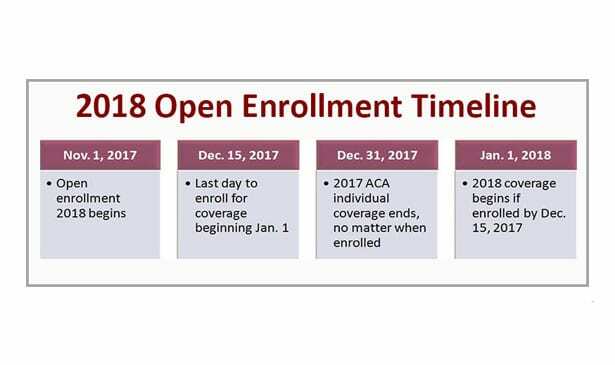 This is the shortest enrollment period (45 days) in recent years, so those without health care coverage should act immediately. To qualify for federal tax subsidies to offset the rising cost of health insurance premiums, those seeking to apply should go online to www.healthcare.gov. Most of those who get their health insurance coverage through the ACA are eligible for what are known as Advanced Premium Tax Subsidies (APT). In some states, the average ACA health insurance premium is calculated at $662 per month, but after the APT subsidy tax credit kicks in, that comes down to just $129 per month, and in some cases, as low as $87 a month. In many states last year, enrollment was down. Observers say one of the reasons for the decrease was uncertainty about the future of the ACA, especially after Donald Trump won the 2016 presidential election, vowing to mothball the federal law, which he and the Republican Congress have repeatedly tried, but failed to do. Applicants are generally “…guaranteed to be insurable and are encouraged to sign up for health insurance….” through the ACA if they currently have ACA coverage, but want to change their plan for 2018; they don’t have health insurance through their employer or spouse’s employer; they don’t have government coverage (veterans, Medicaid or Medicare); or they’re older than 26 and are no longer on their parents’ policy. Failure in having health insurance in 2018 will result in a sizable tax penalty, officials warn. For the past two years, that fee has been $695.00 per uninsured adult, and $347.00 per uninsured child, or 2.5 percent of household income, whichever is higher. For more information, call 1-800-318-2596, or go to www.healthcare.gov.